Grilling perfect burgers is easy with some basic tips. This Best Basic Burger Recipe is a foundational recipe to build from to make great burgers. Divide ground beef into 4 (½-pound) or 6 (1/3-pound) portions. Gently form into patties of equal size (1-inch thickness) without overworking the meat. Gently create a divot with thumb in the center of each burger. Arrange on a plate in a single layer, cover and chill for at least 1 hour and up to 6 hours. Heat the grill to high (gas or charcoal). Brush and oil the grill. 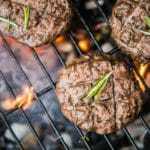 Lightly brush one side of the burgers with olive oil, place them on the grill (olive oil side down); brush the top side with olive oil. Cover, cook for 2-3 minutes to sear the bottom (you should see grill marks). Flip and cook an additional 2-3 minutes for rare, 4-5 for medium-rare or 6-7 for medium doneness as measured with an Instant Read thermometer. If adding sliced cheese, add 2 minutes before burger is finished grilling. NOTE: time will be less if cooking 1/3-pound burgers. Remove and allow to rest 5 minutes. Assemble the burger with a slice of lettuce between the bottom bun and the burger (helps keep the bun intact) and condiments or toppings on top.